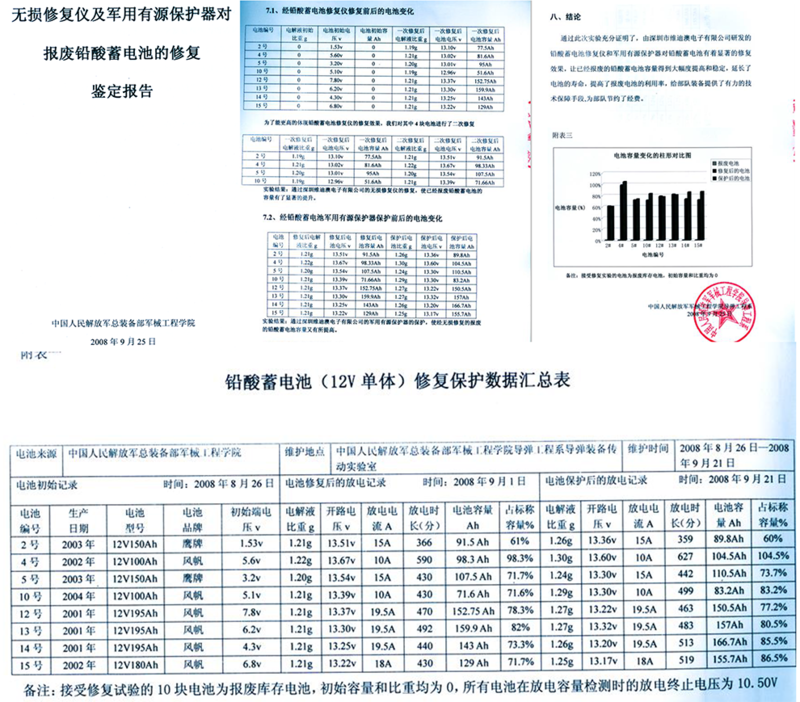 Military Appilications - Shenzhen Daceen Technology Co., Ltd.
From 1999/Oct, Tests conducted by China PLA, General Staff Department and Military Region of Guangzhou & Ji'nan. In May 2008, Department of Missile Engineering selected the batteries without deformed appearance and its polar plate has no obvious corrosion, but due to low voltage (1.12V-8.0V), the battery (Used for 4 years) is stored in warehouse for a long time after being discarded. 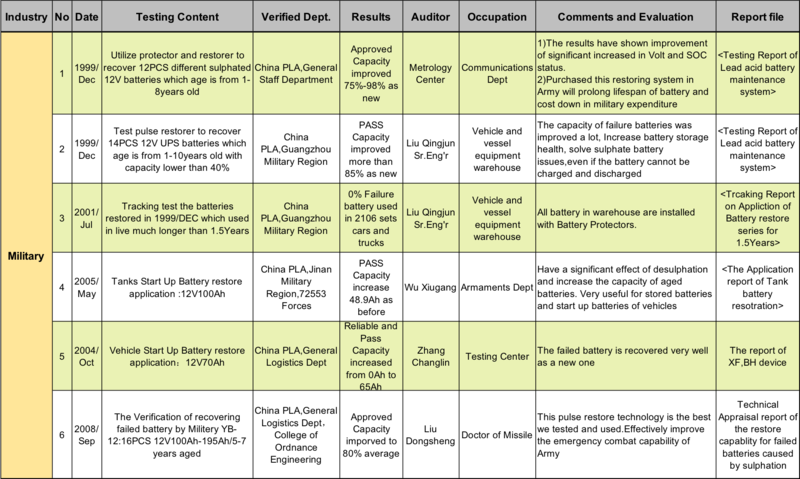 Liu Dongsheng, a professor from Department of Missile Engineering of Ordnance Engineering College--published his academic paper titled as <Military Storage Battery Automatic Maintenance System> in June 2010. The paper explains the application of intelligent repair technology using our company's equipment and power supply recovery of various vehicles and weapon system using our company`s technology. It proves that the technology can save military expenditure and promote emergency fighting ability. In December 1999, vehicle and ship equipment warehouse in Guangzhou military region selected the batteries (including maintenance-free batteries) produced in 1985-1997 which come from different manufacturer brands with different capacity. For the 14 PCS batteries without obvious deformation on appearance and corrosion on its cell plates appearance, it stored in warehouse for a long time but not subject to maintenance after being discarded, our equipment technology can be applied to repair such batteries for 1 to 2 cycles. Among the 14 PCS batteries, capacity of 2 batteries rises up to above 87%, that of 9 batteries above 92% which is close to rated capacity of new battery. And the other batteries with damaged plates also at least rise up to above 20%.